Internet Accounts pane, new to recent versions of OS X, provides system-wide mail settings, but many mail clients do not use those settings. No matter how popular social networking such as Facebook and Twitter, electronic mail remains one of the fundamental network services. Unless you run your own local mail server, your Mac and other mail-enabled devices run mail client apps, of which the standard for OS X and iOS is Apple’s Mail app. In this article, I will refer to that as Mail (with the capital letter, prefaced with “Apple’s” if there is any doubt) to distinguish it from mail as a service, and the items transferred by the mail service as messages. SMTP (Simple Mail Transfer Protocol), in which the client tells the server that it has outgoing mail to send via an intermittent connection. There are also proprietary protocols used by Microsoft Exchange and Lotus Domino/Notes servers, and some others which you may encounter on occasion. You will need mail client software with specific support for those protocols if you wish to access their servers, although the servers may also support more standard protocols. It may be worth discussing such support with their administrators, if needed. Many mail services also support browser-based access, although that can be clumsy for regular access to busy accounts. 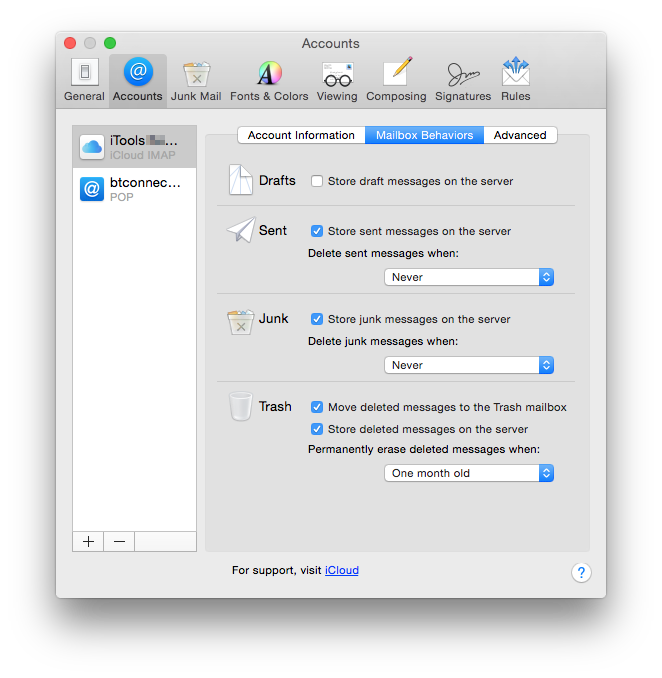 Mail client apps also differ in their support for different protocols. Apple’s Mail app supports all three, but is primarily tailored to work with its own iCloud-based IMAP and SMTP services. The great majority of mail clients support POP for receiving incoming messages, and SMTP for sending outgoing messages, which is the vanilla flavour for mail services around the world. Mail’s Mailbox Behaviours set for iCloud, an IMAP service, with its rich options. IMAP is a more sophisticated and complicated system which is ideal for those who access the same mail account(s) using two or more different devices. This is because, by default, all messages are kept on the server unless deleted under control of the mail client. With POP services, as each message is downloaded to the client, it is removed from the server, which limits its usefulness when you access the same account from your Mac and iPhone, for example. 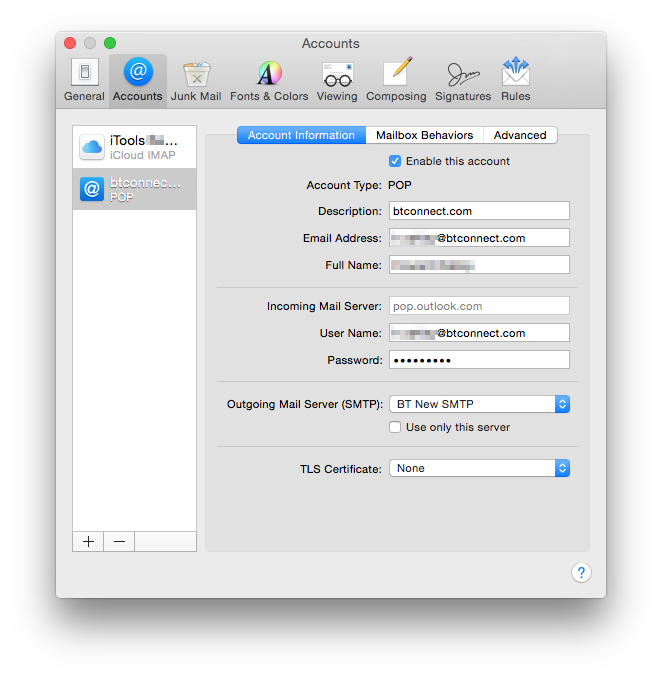 Mail’s basic settings for a POP and SMTP mail service. Different mail services – Apple’s iCloud mail, Google Mail (Gmail), each ISP – offer a different range of protocols and services. When you sign up to a service, you need to choose and configure the options to meet your requirements. As a general rule, if you are only going to access your account from a single Mac, using POP and SMTP is perfectly adequate and keeps life simple. If you need to access the account from your iPhone or iPad too, then IMAP is almost essential, and that is likely to use SMTP for sending messages (although some IMAP services support sending by IMAP too). 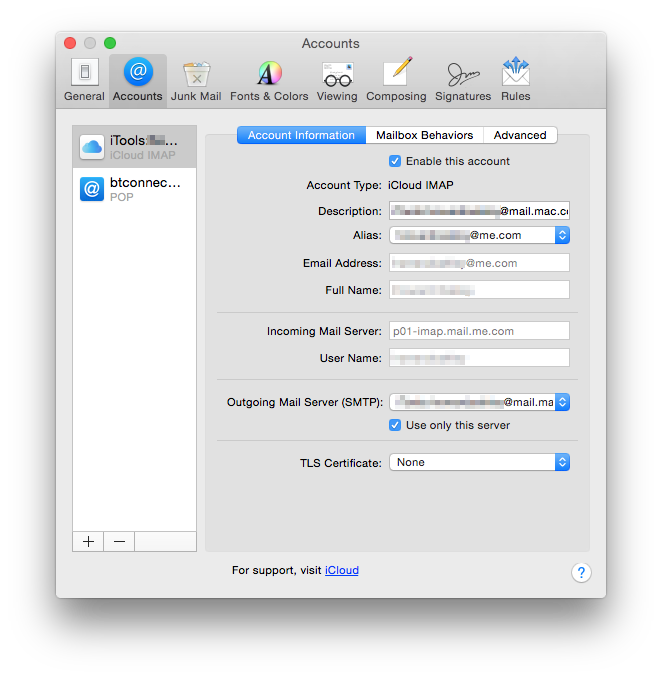 Mail’s basic account settings for iCloud IMAP services. You should also read the support pages about configuring your mail client app to work with that service. Mail servers have many different options, and each service is therefore subtly different. Apps like Mail try to choose the best settings for different services, but these do not always work first time, and you may need to tweak server options and client settings before you have got them right. Often it is simplest to make your initial connection using iOS, which tends to work more reliably and get things right for you. Once that is working you can copy the settings in iOS Mail to OS X Mail, or your other mail client software. Your mail client app will also have documentation that you should check. Apple’s Mail has become more complex in recent years, as some of its settings have been moved to make them more generic. Now basic account configuration should be performed in the Internet Accounts pane of System Preferences, then checked in the Accounts section of Mail’s Preferences. 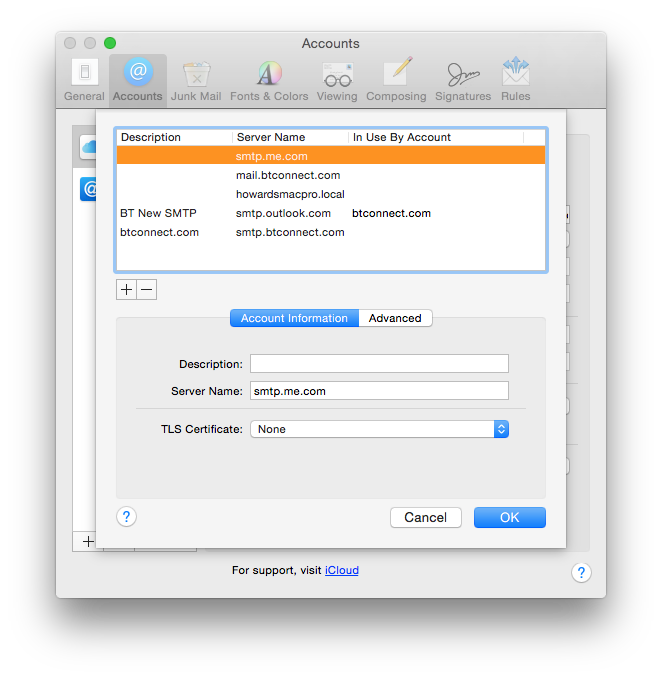 Mail’s SMTP server settings for Apple’s iCloud service. SMTP server settings are also more complex, as they are maintained in a separate list, accessed through the Outgoing Mail Server (SMTP) item in the Account Information tab of the Accounts section. Some recent problems have resulted from a glitch in these, in turn caused by OS X updates: the fix was to remove the old list of SMTP servers and build a new one. Third-party mail clients may ignore settings in Internet Accounts and Mail’s list of SMTP servers, though, and require their own Preference settings to be completed in full. When your mail client connects to the mail server, it does so by a series of message exchanges resembling a conversation. These involve the initial request for a connection, which leads to authentication. Once connected, the client will request services from the server, and in the case of POP and SMTP will disconnect on their completion. Authentication problems are the most common, and often occur when mail client settings are perfectly correct, but the mail server is too busy, or is being attacked as a ‘denial of service’ (DOS). In those circumstances, it may return an error code and message, which your mail client interprets as the wrong user name or password. If that occurs and you are confident that the user name and password are correct, simply cancel any response. Leave it a few minutes and try again, as your client app will probably connect successfully then. I will deal with the diagnosis and management of problems in a separate article. Posted in Macs, Technology and tagged email, Exchange, gmail, IMAP, Mac, Mail, mail client, POP, SMTP. Bookmark the permalink.